An hour into Justin Trudeau’s armchair discussion with Bill Nye ‘the Science Guy,’ all seemed to be going as planned. 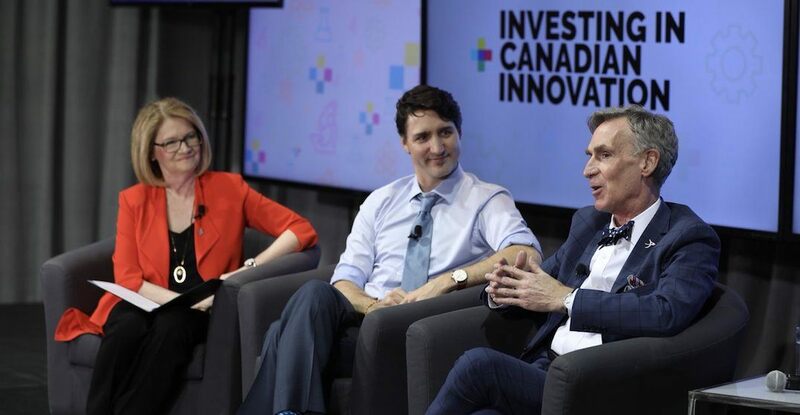 The unlikely duo discussed how the government plans to invest in Canadian innovation, and the topics they touched on ranged from fighting diseases to developing new technology. The event, which took place in Ottawa on Tuesday morning, took a turn in the last few minutes when Nye raised questions about the Kinder Morgan pipeline. Nye then cited a study from The Solutions Project which found that Canada could entirely replace fossil fuels by switching to renewable energy sources. Trudeau defended the pipeline further saying Alberta put a cap on oil-sands emissions. In November, The National Energy Board (NEB) permitted Kinder Morgan to skip the City of Burnaby’s bylaws that act as obstacles for the Trans Mountain pipeline expansion project. Stop calling this man a scientist. He’s as much a scientist as I am a lawyer. Actually no, I’m more of a lawyer cos that was actually my 1st undergrad. He doesn’t have a science degree at all. Could they not have found an actual legit scientist to challenge Trudeau properly? Science in CANADA… So let’s get an ACTOR from America.